C & C Hydraulics LLC is dedicated to helping industry meet today's economic and environmental concerns in dealing with industrial fluids. We offer a full line of hydraulic services, from in-plant design and installation of state-of-the-art hydraulic systems, to system repair and overhaul, hydraulic fluid filtration, water glycol retrofitting, and consultation. 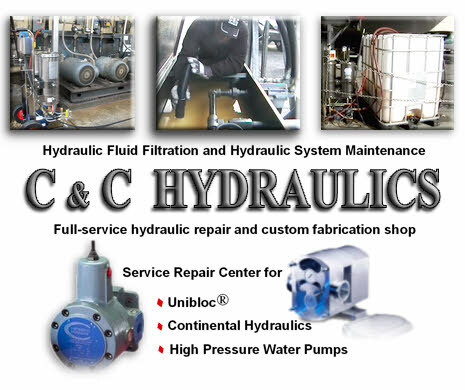 We are a fully-equipped hydraulic repair and custom fabrication shop, and are a service repair center for Continental Hydraulics and Unibloc pumps. We rebuild pumps, motors, cylinders, and more. We filter hydraulic oil, gear lube, transmission fluid, diesel fuel, as well as water glycol. An optimally-running hydraulic system means increased productivity and savings. We can help you achieve that goal. Service and Repairs Done With "I Love My Job" Quality! Copyright 2019 C & C Hydraulics LLC. All Rights Reserved.